Tales of Little Women originally aired in 1987 as one of Nippon Animation's World Masterpiece Theater programs. Many staffers from Studio Ghibli such as Yoshifumi Kondo were involved in multiple production positions. 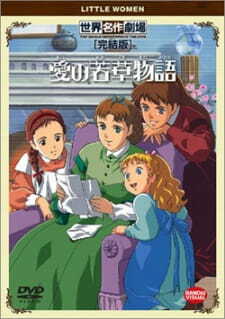 Tales of Little Women was licensed and dubbed by Saban Entertainment, and broadcasted on HBO in 1988 in North America. This made it one of only three World Masterpiece Theater programs to be dubbed in English. I have been recently going through the old World Masterpiece Theater collection and this one is a very good adaptation of Little Women by Louisa May Alcott. The story is about the March family having to make ends meet in Newport (Concord), Massachusetts during the back drop of the American Civil War. The show also takes some liberties on the original story in a respectful way, mostly adding more back story to the March family and how they came to be at the beginning of the book. The characters are balanced, Amy tends to be very unlikeable in this show at first. But you begin to understand her mindset as a child during the progression of the story. Jo is always assertive, but has an underling self doubt. Meg feels as though she has to help fill in a mother role for her sisters and not live out her life. And Beth is very quite and self sacrificing even if it is a detriment to her self. I think how each character is so different is what made me really enjoy them. I really enjoyed the style, from what I understand it had some Studio Ghibli people working on it. The animation is above average for the time period, which surprised me but I guess that is typical for WMT. The art direction/design is similar to that of My Neighbor Totoro or Kiki's Delivery Service. The sound and music are very fitting, the dubbed version has new ending and opening English tracks. But oddly all of the other music is left in place, I do not see this very often from shows during the 1980s. I saw some of it subbed and all of it dubbed. The dub is fine for the 1980s period nothing embarrassing acting wise, and completely watchable. I would like to see it again subbed, but there does not appear to be any place at the moment to watch it completely. The dub however, is complete on Amazon Prime as I write this. Overall I would recommend this show to people that like the work of Studio Ghibli, Louisa May Alcott, and PBS dramas. It is definitely not an action oriented show so I would not say watch it if you do not like dramas.